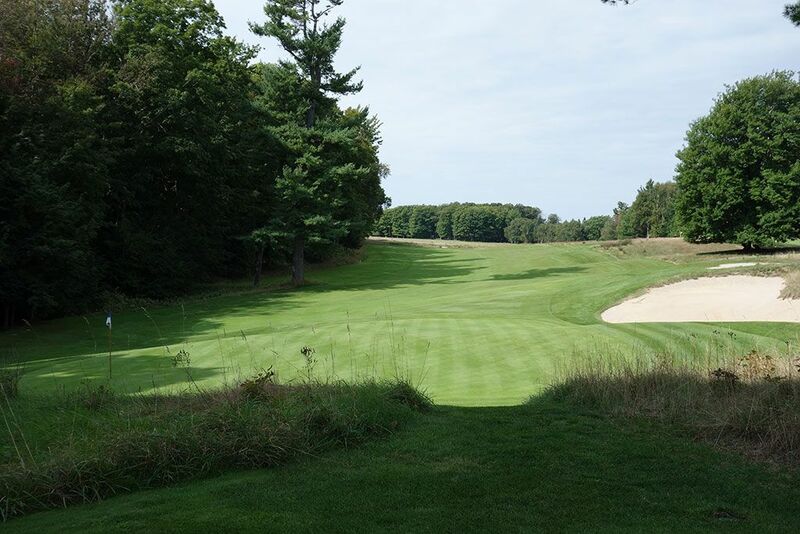 Accolades: Ranked 3rd in Michigan on Golf Course Gurus' Best in State list. What to Expect: Special. That is the first word that comes to mind when I reflect on Crystal Downs. 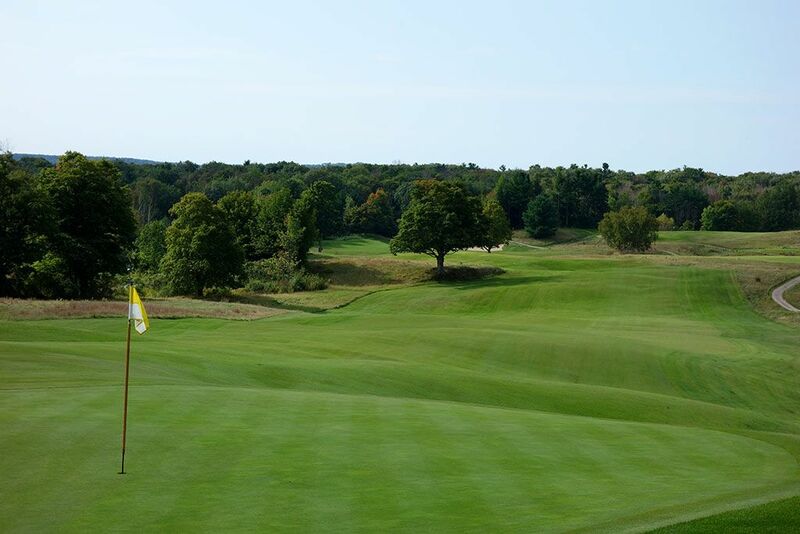 Everything about Crystal Downs is special to the golfer that has developed a palate for the subtleties found in masterful architecture; architecture that challenges the mind as much as the body. Players are taken on a roller coaster of emotions as they traverse in and out of holes that range from being relatively easy to diabolically difficult to flat out brilliant. I've never played a course that I wanted to replay immediately afterwards as much as Crystal Downs. The subtleties in the design just beg you to come back and challenge again to see if you can play better the second time around. 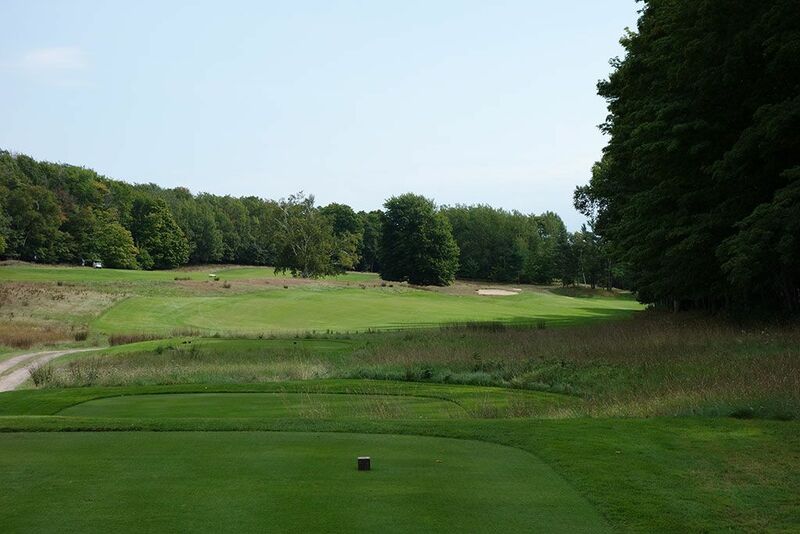 The course is short enough that you think you should be able to take advantage of it, but in the same vein as Merion, Crystal Downs demands respect and wisdom in every shot to avoid being punished more harshly than you would imagine. The speed and slope of the greens command absolute precision and will quickly expose any shortcomings you have with your putter or wedges; more so than any other course I've seen. 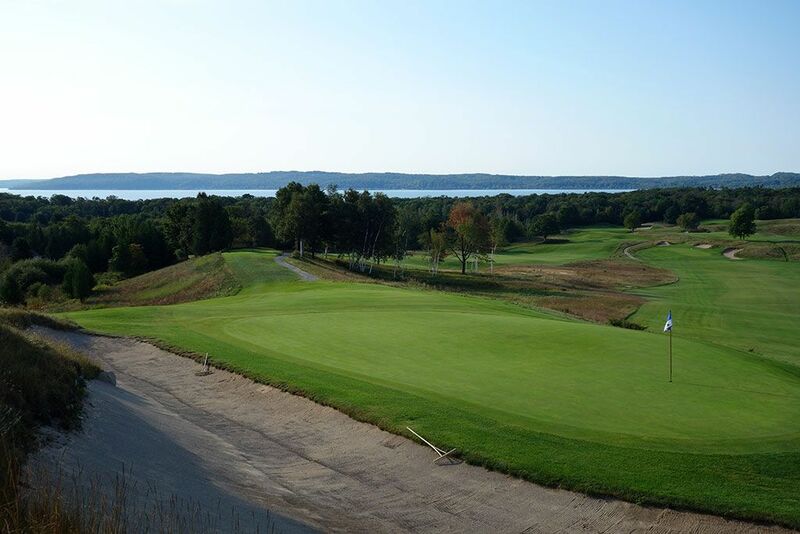 From the pro shop and first tee you have a view of the entire front nine coupled with views of Crystal Lake; it is truly one of the most impressive panoramas in all of golf. On the back nine you are afforded glimpses of Lake Michigan and I was surprised there weren't more views of it, but the course is so good on its own that the backdrops suddenly don't matter that much. Holes 5-9 can only be rivaled by Pebble Beach as one of my all time favorite front nine stretches in golf, #13 is one of the finest and most demanding two-shotters I've had the privilege of playing, and #17 launched itself to the top of my favorite driveable par 4s. The first time around the course there might be a couple of holes that don't wow you or perhaps are drowned out due to how phenomenal other holes on the property are, but I think you'll find greater appreciation for those understated holes in subsequent loops around Crystal Downs. 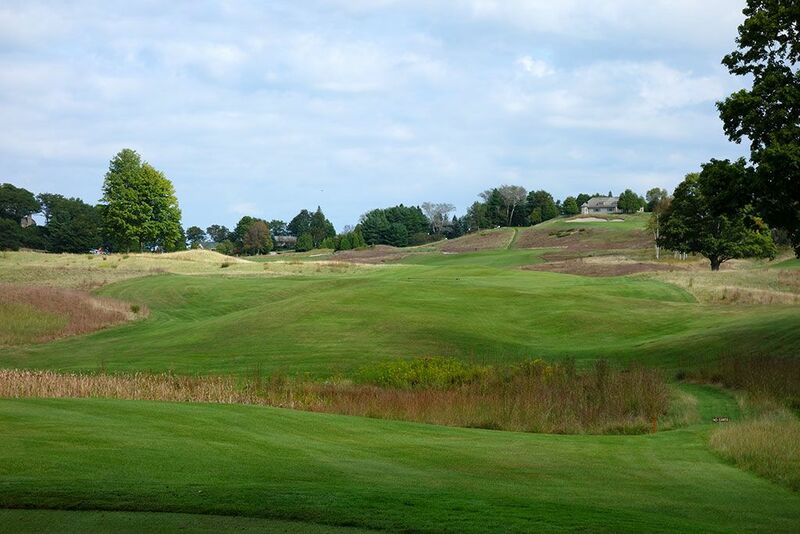 The course is a challenging walk given how hilly the terrain is and caddies are available through the main season though many players will elect to ride a cart. Crystal Downs may rivals Cypress Point as having the most understated pro shop and general amenities in contrast to how incredible the golf is; something I really love because it shows how the club is simply all about golf. 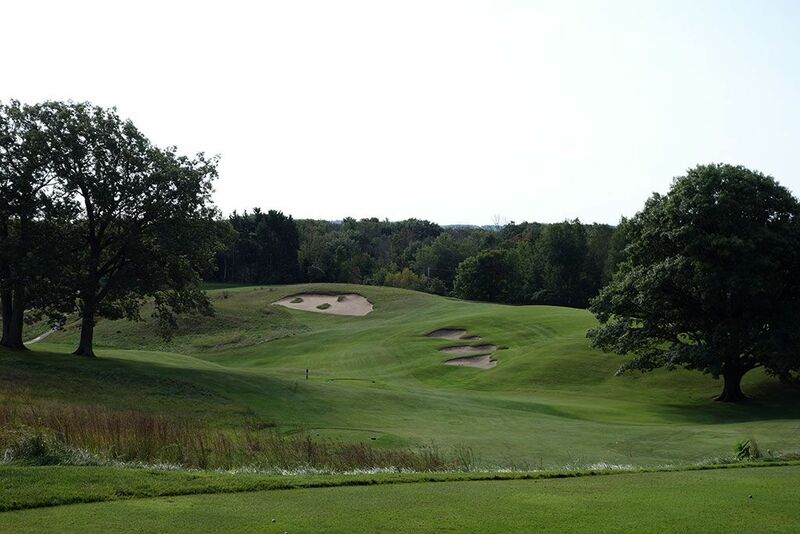 It has nothing to do with the course itself, but it should be noted that the staff and membership are perhaps the most down to earth people I've come across at a Top 20 course and appreciate visitors who know and understand golf course architecture and the brilliance that is Crystal Downs. Signature Hole: 17th Hole – 311 Yard Par 4 – Crystal Downs lays claim to a handful of the finest golf holes on the planet and this is certainly one of them. 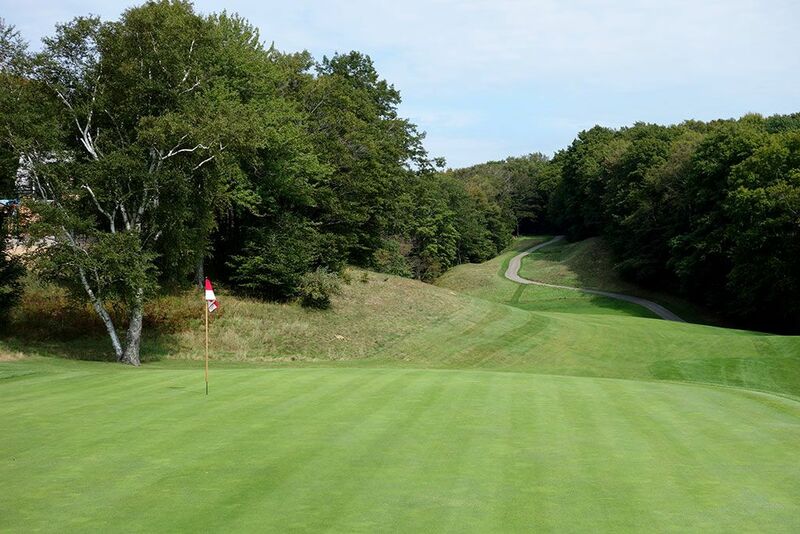 The 17th at Crystal Downs is the most treacherous driveable par four you are likely to ever face. When the wind is in your face tunnelled through the trees the green becomes unreachable and players have to figure out a safe place to hit their tee ball. The fairway tilts severely from right to left and features limited good options. A tee shot that doesn't carry 180 yards will require hacking out of the junk into the fairway and effectively eliminating any birdie chance. A 200 yard tee shot will feed into a popular bowl to hit from although the angle leaves a limited view of the green. Tee shots that go deep up the left side are dead while a 250 - 280 drive towards the right greenside bunker will leave the ideal spot to hit from. 311 yards may look like a pushover on the scorecard but I have no doubt that this hole plays over par every single day of the year. Best Par 3: 9th Hole – 175 Yards – Another brilliantly difficult hole that just doesn't seem that intimidating from the tee. While the uphill nature of the tee shot may get into some golfer's heads, it is everything around the green that should be kicking the fear in. The safe play is short right, but not so short that your ball feeds right back down the fairway. Carrying it to long on the right side and finding the bunker will result in one of the most difficult sand saves of your life given how nasty the green is at feeding balls away from the hole and back to the front edge of the green or off altogether. Anything left of the green is an instant double bogey . . . at best. 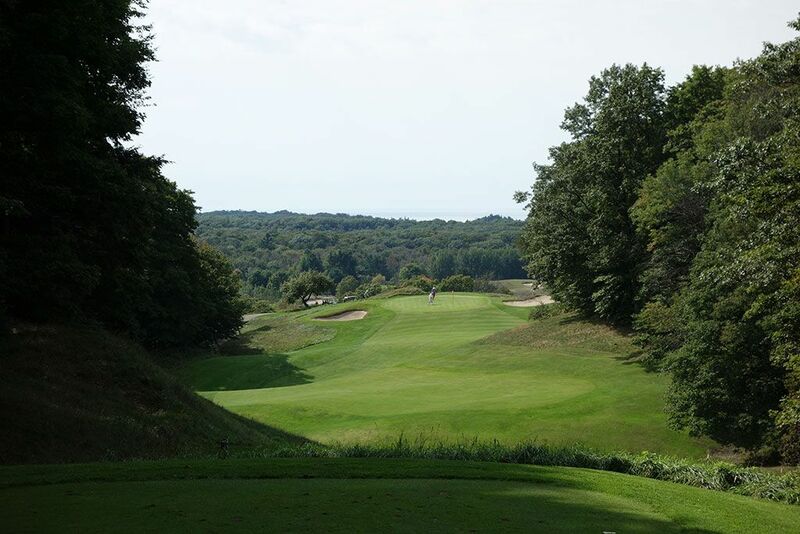 Best Par 4: 5th Hole – 353 Yards – Perhaps Crystal Downs' most acclaimed hole, the 5th is a wonderful example of not needing a ton of length to have a strategic hole with sufficient difficulty. The brilliance in any design incorporates viable options throughout rather than demanding specific shots all day long. On the 5th hole multiple options are presented off the tee since a trio of bunkers part the hogback fairway. The safest tee shot is left of the bunker but sets up a blind approach shot to a green that slopes away from the player. 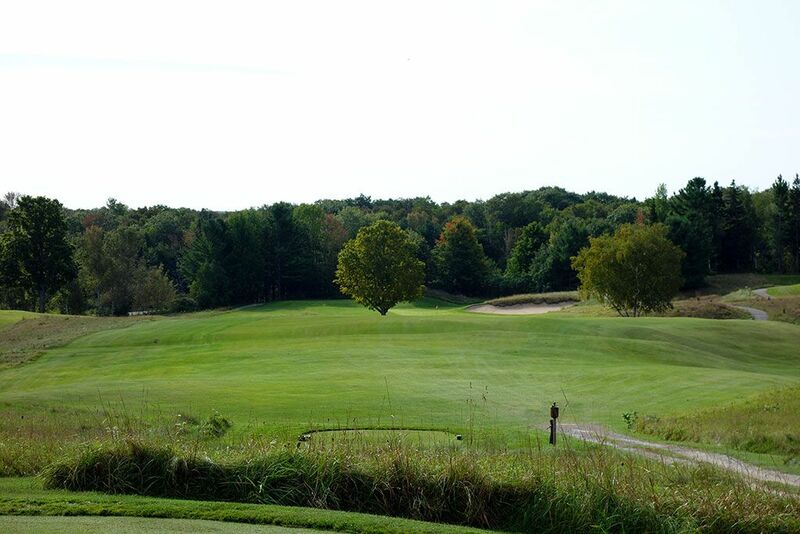 Hitting right of the bunkers sets up a much better angle to the green but brings a large tree into play and long ballers may have their tee shot scoot into trouble since a view of the right side of the hogback fairway is not offered. Some players may elect to stay short of the bunker trio while other may want to test their merits at carrying the spacious bunker in the waste area with a power fade that can feed the ball up near the green. 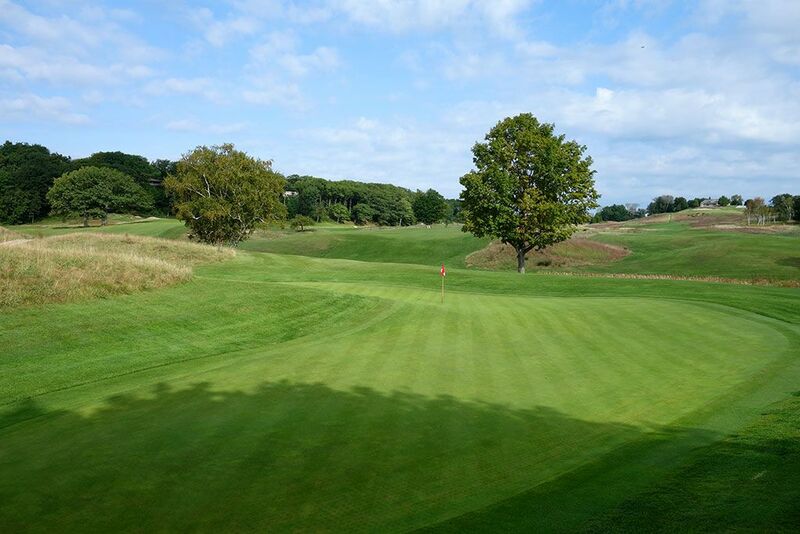 The theme of difficult greens is back in full force on the 5th hole which features a severely sloped back-to-front and left-to-right surface that often feeds balls to the grass edge between the green and bunkers. Holes like this make Crystal Downs and Merion the most well designed and difficult "short" courses in the country. Best Par 5: 8th Hole – 550 Yards – Another great hole and one of the most revered par fives in world. 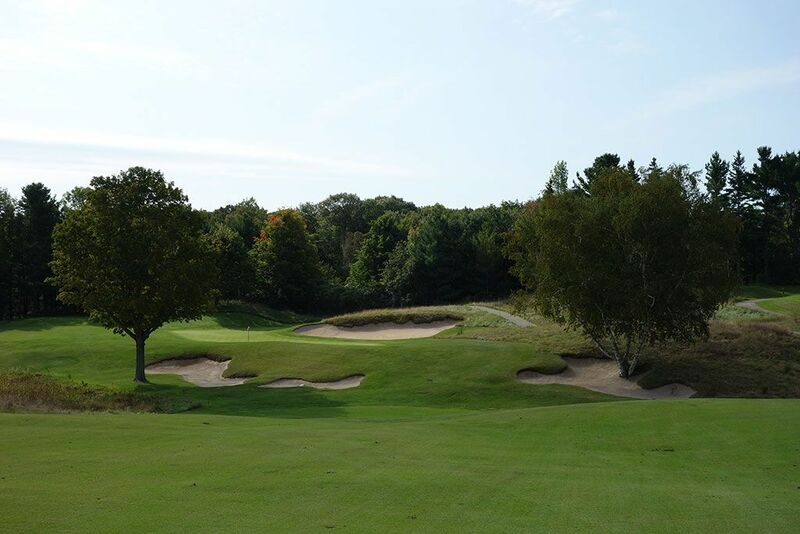 In a day and age where architects often feel they need to laden a hole with an undue amount of bunkering or hazards, Dr. MacKenzie lets Mother Earth be the star here by draping this three-shotter over a very undulated fairway that climbs uphill the whole way home. 550 yards may seem reachable for some players, but the significant uphill climb eliminates that thought for most players as they just try to figure out a good spot to hit their third shot from to attack the green. 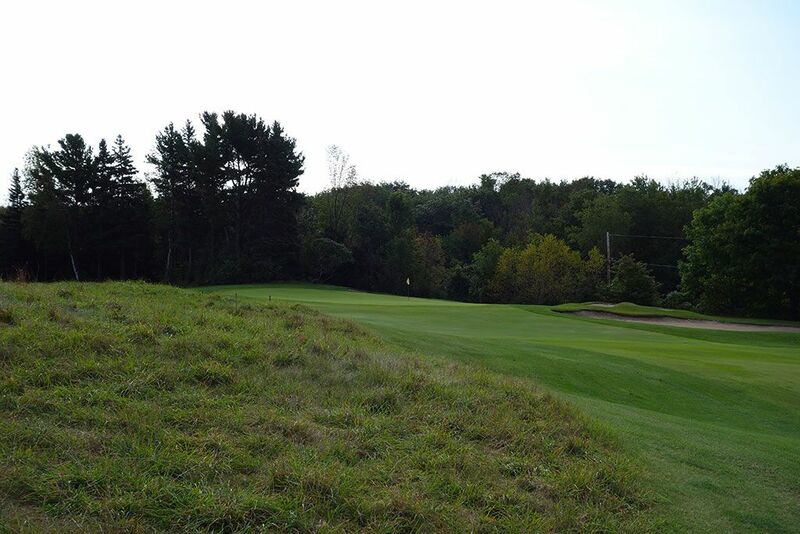 There are so many undulations throughout the wide fairway that it is useless to focus on any one particular location as a lay up zone, but I will recommend that you lay up closer to the green than your traditional "favorite yardage" since the uphill nature of the approach shot will add a full club to reach the small green. Perfect golf is required to birdie this hole; near perfect golf is needed for a par. 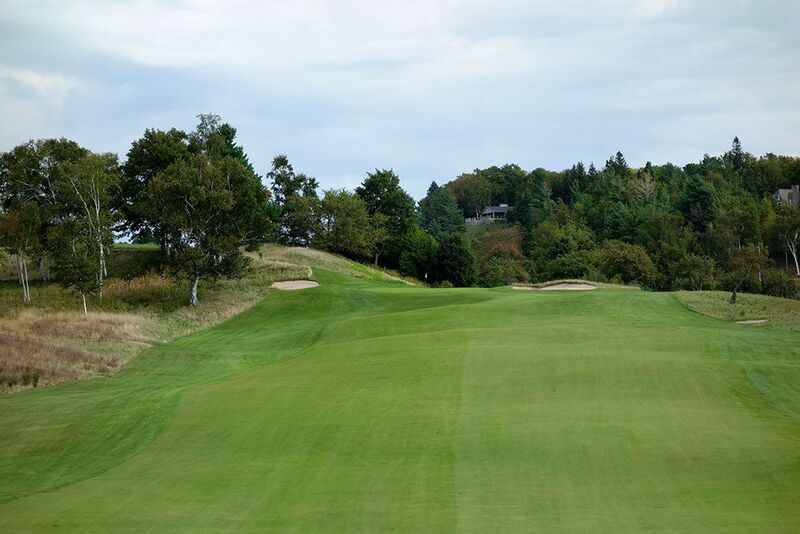 Birdie Time: 7th Hole – 335 Yard Par 4 – How could anyone ever tire of playing Crystal Downs? It is a living masterpiece and the 7th hole features on of the most unforgettable greens you'll ever play. The tee shot plays to a fairway that runs out of room about 225 yards from the tee. Most players will play short of that drop off and allow themselves a clean view of the boomerang green that lies in wait. Bolder players may elect to hit their tee shot into the swell beyond the end of the fairway and leave themselves with a shorter, but blind approach to the green. The boomerang shaped green wraps around a hill which also features a pair of sloping bunkers. If you can't have fun putting on this green to the various pin locations then you need to pick up backgammon or something because this green is a blast! 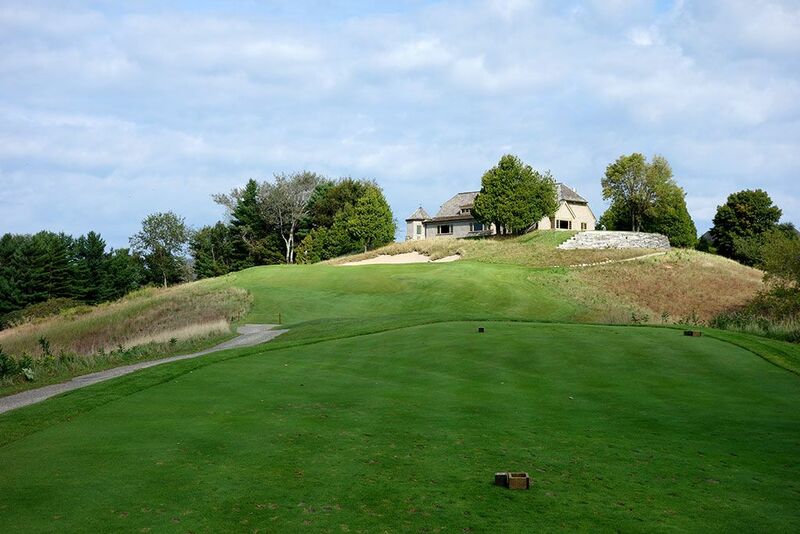 Bogey Beware: 13th Hole – 442 Yard Par 4 – Writing this review reminds me of just how good Crystal Downs is. Each time I get to a hole to write commentary on I think, "Oh yeah, that really was an awesome hole!" The 13th is one of my all time favorite par fours which is saying alot considering my favorite two-shotters are generally oceanside like Pebble Beach's 8th, Cypress Point's 17th, and Maidstone's 9th.. 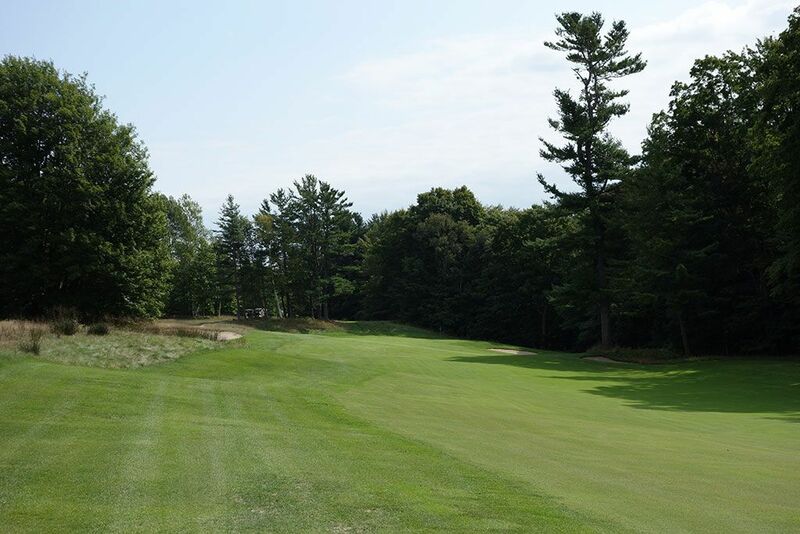 This dogleg right calls for a fade off the tee that falls on the right half of the fairway while avoiding the forest and bunker right of the rough. A shot that comes to rest short of the right fairway bunker will be greeted by a looming tree that will block, or at a minimum alter, your approach shot into the green. Approaching this green from the left is instant death as the vast majority of balls will end up tumbling into the right greenside bunker. To say that the front-to-back and left-to-right tilt of the green is severe would be an understatement considering some might even contend it isn't fair, but that is some of the beauty of this hole. The middle of the green is divided by a ridge that causes more havoc in a green than any other I can recall. 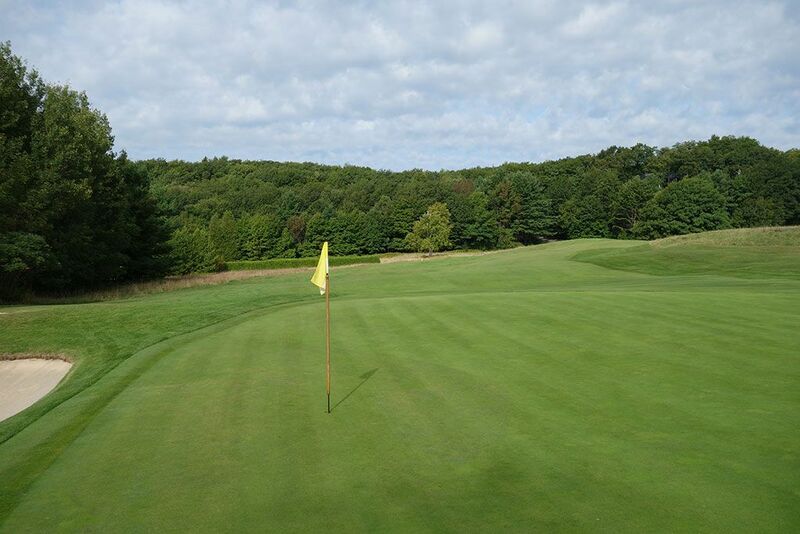 If your ball is resting on the opposite side of the ridge from the hole your chances of two-putting are quite low considering how difficult it is to even keep the ball on the green while crossing the ridge. 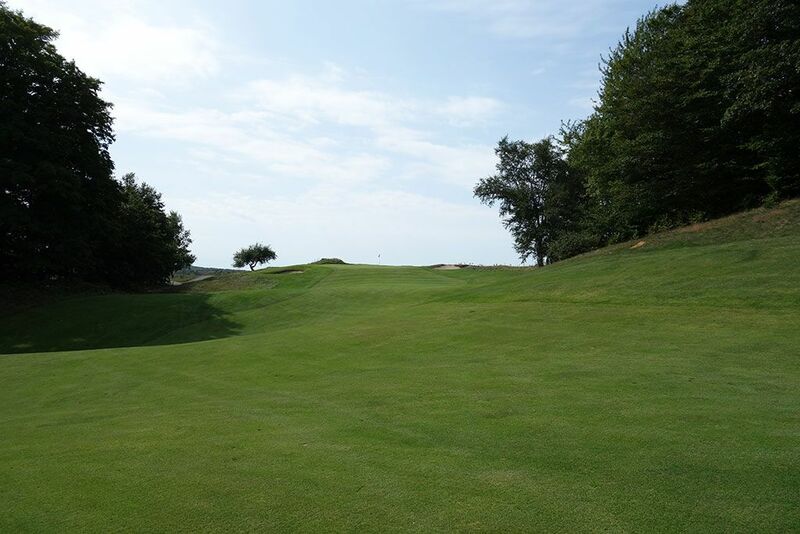 To tame this beast with a four or better may be the most rewarding experience on the course considering it is easily the toughest par on the course. If someone told me there were more snowman scores on this hole than pars I would believe it.